The much anticipated revised English translation of Saviours of Islamic Spirit (Tarikh-i Da’wat wa Azimat) by Shaykh Abu ‘l-Hasan Ali al-Nadwi (ra) has been released by White Thread Press. The work was originally rendered into English by the late Mohiuddin Ahmad (may Allah have mercy upon his soul), who has also translated other works of Shaykh Nadwi (ra). The initial publication of that translation was released by the Academy of Islamic Research & Publications (Lucknow, India). A later publication of the same translation – without editing – was done by Darul Ishaat (Karachi, Pakistan). May Allah (SWT) reward them as they were the only conduits through which this highly regarded work was available to the English-speaking audience. Notwithstanding, some of the language in the translation had become archaic. Also, the original publication’s quality was in much need of revamping in regards to the typesetting, print, paper quality, binding, cover, etc. White Thread Press embarked upon this project some time back, and we had been eagerly awaiting news of its progress. All praise belongs to Allah (SWT) who brought the project to fruition. Mufti Abdur-Rahman Ibn Yusuf Mangera (may Allah bless and accept him) revised and edited the work, and it has now been released by White Thread Press. Currently, only the 1st volume is published and available. We pray and hope that WTP continues to pursue the editing and publishing of the remainder volumes to complete the entire series (containing the biographies of Ibn Taymiyya, Nizāmuddin Awliya, Mujaddid Alf-Thāni, Shah Walīullah, Syed Ahmad Shahīd, and more). Twenty-three years after its first publication in 1983, Muḥammad: his life based on the earliest sources by the late Abū Bakr Sirāj al-Dīn (Martin Lings, d. 2004) continues its lead as the best-written work of Prophetic biography in English and has now been translated into a dozen languages. The readers’ blurbs from distinguished writers on the back cover call it “superb… scrupulous… exhaustive… mesmerising… easy and absorbing… enthralling… engrossing… majestic… gripping… fascinat[ing].” Indeed, Lings’ lofty English, his knowledge of genealogy, his reflexive and worshipful narrative style, and his excellent adab with the Prophet (upon him blessings and peace) all deserve such glowing praise. 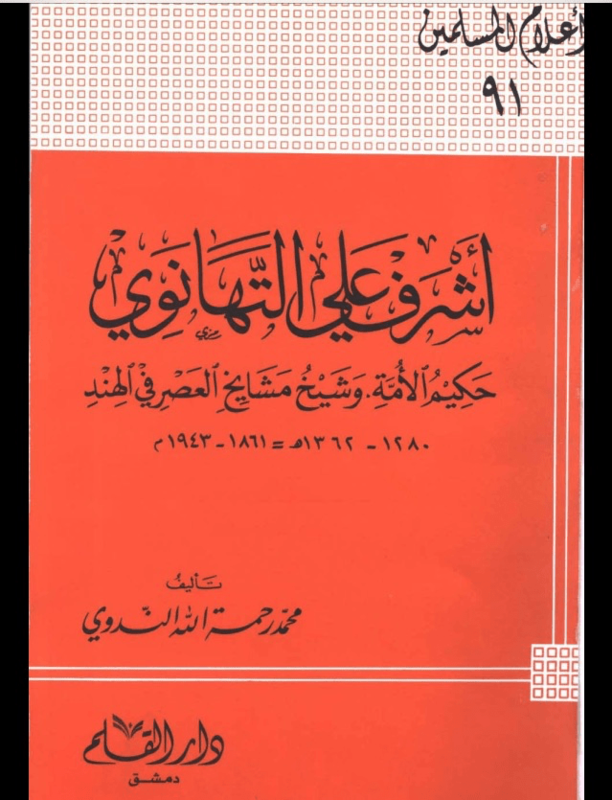 A 563-page Arabic biography of Hakim al-Ummah Mawlana Ashraf Ali al-Thanawi (ra), written by Mawlana Muhammad Rahmatullah Nadwi. Contains an introduction by Mawlana Syed Rabi’ Hasani Nadwi (db) [the nephew of Mawlana Abul Hasan Ali al-Nadwi (ra) and his successor as the rector of the renowned seminary Nadwat al-Ulama]. Courtesy of Dr. Hanif Kamal of Ashrafiya.